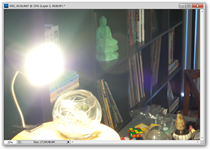 HDR tone mapping is everywhere these days; it’s sort of like Auto-Tuning equivalent of photography. Want to create High Dynamic Range images without the “HDR” look? Open up Photoshop or GIMP, and get ready to hack some images! If you remember from our previous article, HDR is a blanket term for drawing out lots of detail from multiple exposures and loads of artful techniques, all with the intention of creating images with detail beyond the capabilities of normal cameras. Keep reading to see how a few photographs, manual settings, and image editing skills can create amazing HDR photographs. Yes, before we start, we should cover this point. We won’t be discussing any tone mapping HDR programs in this article, like Adobe’s Photoshop plug in, HDR Pro, or Photomatrix. 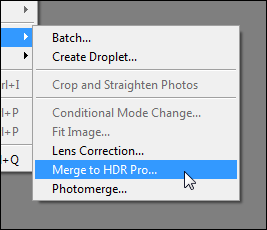 Instead, we’ll be covering a technique for manually combining image data to create a rich looking HDR image without any complicated tone mapping software. One of the keys to creating HDR images is bracketing your exposure. For this example, we’ve photographed this still life multiple times, each with different manual settings. This is called “bracketing,” and it involves taking a shot multiple times (presumably with a tripod) while changing the exposure by stopping up or down the various elements: aperture, shutter speed, and ISO. 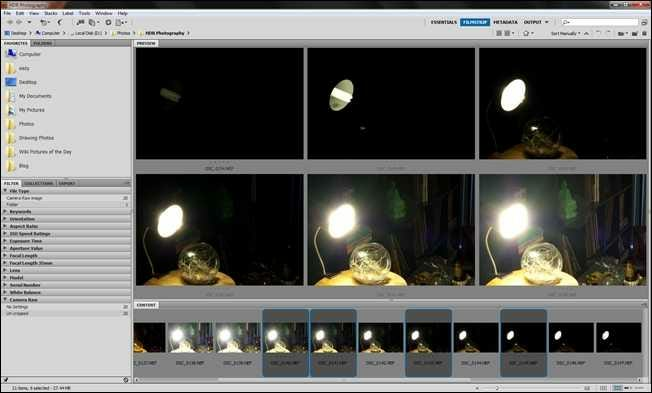 In our example, we’ve kept the same ISO and aperture settings, adjusting the length of the exposure to allow more light to the sensor. 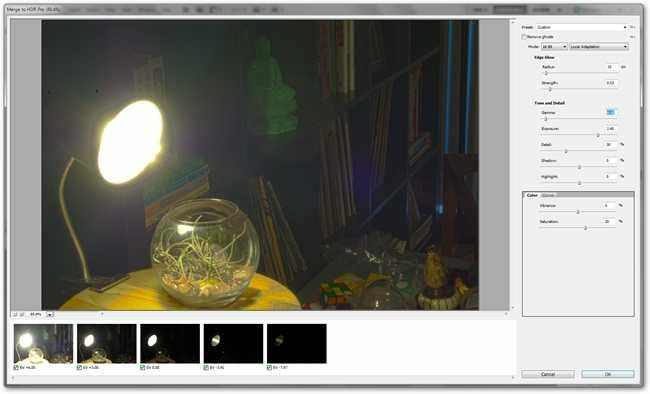 Note the detail in the light bulb in the darkest images, while the brightest images show more detail in the shadow areas. 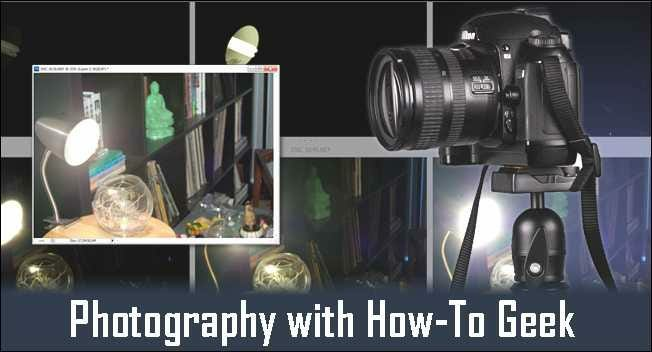 Take as many photographs of your image as you care to, adjusting each exposure by one stop. It’s always better to to take more images than you need and bracket way to much than to bracket too little and be sorry later. With the proper images, it’s possible to build an HDR image in Photoshop or GIMP. We’ve taken three of our images. The first one uses ISO 200 (very slow, better detail, less grain) and an f25 (blocks most of the light) aperture setting at a very fast shutter speed. The third one uses the same ISO and f stop setttings, but uses a much slower shutter speed, possibly as slow as 15 seconds. The first has great detail in the brightest areas (you can read the text on the lightbulb) and the third image has detail the other images lack in the shadows. The middle image was taken using the same tripod composition, opting instead for auto settings and a flash exposure. This, more so than the manual exposures with auto white balance, gives a naturalistic image, although it is devoid of detail, both in the bright highlights and dark shadows. Our goal is to transform that “so-so” image into a rich, detail filled HDR image with these three exposures. We start with our darkest image, and set it to be our base layer. 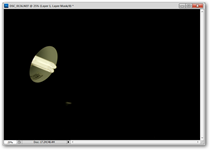 Simply open your darkest image in Photoshop or GIMP and go from there. 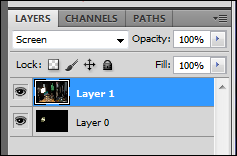 Add your “middle” exposure to a layer on top of your darkest exposure, and set that layer to a Blending Mode of “Screen.” (GIMP simply calls this “Mode.”) You can find this setting in the layer panel of either program. On a related note, if you weren’t careful when exposing your shots, you might find that your entire image or various parts of it move around, causing you to have to shift your image and fit your layers together. This can be tough to avoid, although using a tripod and taking careful shots can certainly help. Use the brush or eraser to subtly mask out areas in your image that you don’t want. 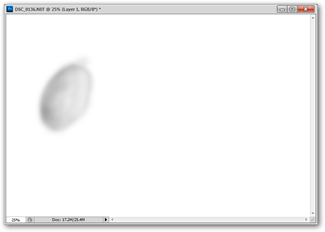 The dark areas on the image on the left represent the masked out (or “hidden”) parts of the “middle” exposure. You can see the mask combined with the two layers on the right, with red halo representing the parts of the lamp that are masked out. Our image now has details in the highlight that weren’t possible with a single exposure. Let’s see if we can’t do something about the dark, foreboding shadows in the background. This exposure is bright, and packed with lots of shadow detail. 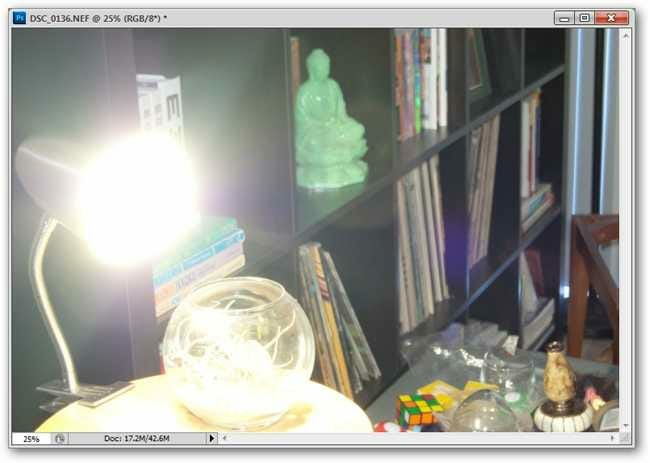 The highlights are washed out the point of being pure, detail-free whites, but the shadows and midtones can prove very useful to our HDR image. Paste your shadow exposure into a third layer on top of the rest. 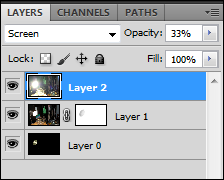 Set it to “Screen” and reduce the opacity (both options available in GIMP and Photoshop in similar places in the layers panel). You may find that your shadow image does not need as much reduction of opacity, depending on how much light it was exposed to, so use whatever opacity works best for you. 33% is not a perfect, one size fits all solution. Create a layer mask on your shadow exposure (just like before) and use your paintbrush (or eraser) to mask out the areas you don’t want. 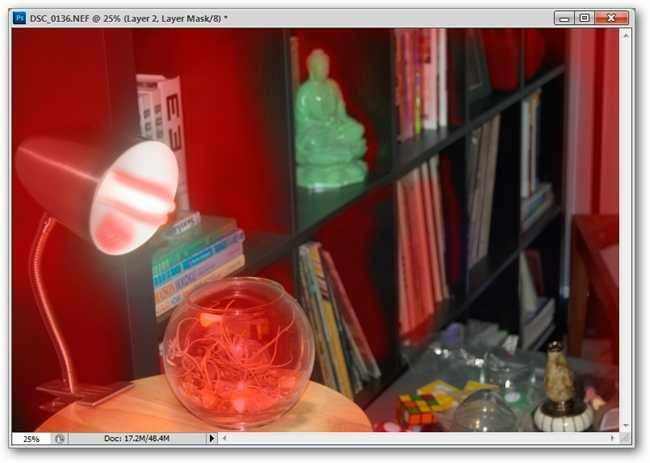 In this example, we’ve masked out the parts of the image that are shown here as red. This allows us to have dark, rich shadows in the areas you would expect them to fall, while allowing the subtle wood grain texture to appear in the previously detail-free black parts of the shelving. Our final image is the successful, subtle combination of three exposures, that has detail that rivals tone mapped HDR images—except without the halos, ghosting, and that obvious “HDR photo” look. If you just want a good, rich HDR image, you could certainly do worse than making your own this way. Image Credits: WF Fancier 535 by F 5.6, available under Creative Commons. All other images by the author.